For movie buffs, October is always a special month, dominated by the London Film Festival, which runs from October 4 - 15. The festival not only showcases new films, but serves as a reminder of the many occasions when London has played a starring role on the silver screen. There have been so many films shot in Belgravia, Kensington and Chelsea that it would be impossible to name them all, but here is our pick of the stand-out movies or television programmes shot in the capital, with homes for sale or to let nearby. 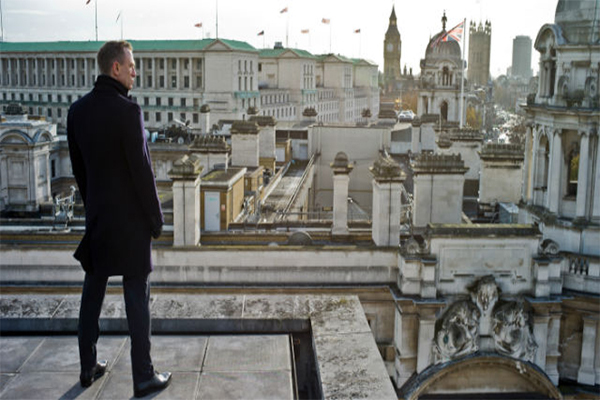 The memorable scene in which M, played by Judi Dench, has her house broken into by Daniel Craig’s Bond, was filmed in a flat on Cadogan Square formerly owned by composer John Barry. The imposing red brick buildings have enduring appeal, attracting families and young professionals to the area. Shifting from classic films to iconic television shows, scenes from Downton Abbey were shot in Belgrave Square, London SW1X. Town houses on the square can cost upwards of £10 million. Clearly nothing but the best would do for the Earl of Grantham and his family. Stanley Kubrick’s masterpiece A Clockwork Orange, in which the King’s Road in Chelsea makes a cameo appearance. The King’s Road is still a hub for fashionable London with The Ivy Chelsea Garden, Bluebird Café and Anthropologie. A Swinging Sixties classic, starring David Hemmings as a fashion photographer, and featuring a trendy party at Cheyne Walk in Chelsea, SW3. The area has attracted numerous movie stars, rock stars and authors over the years from Ian Fleming and Laurence Olivier to Bram Stoker and Mick Jagger. Cheyne Walk was also mentioned in Anthony Horowitz’s Stormbreaker, an action spy novel and movie released in 2006. If Belgravia is not already famous enough, it enjoyed the reflected glory of appearing in a memorable episode of the BBC’s Sherlock, A Scandal in Belgravia. The cobbled street on which Holmes and Watson had one of their tiffs was actually Boscobel Place, a private residential area, just off Elizabeth Street. In 2016, a four-bedroom mews house came on the market in Boscobel Place for £5million – a step-up from Baker Street, where Holmes and Watson might find a snug two-bedroom flat for less than £1million. A Doctor Who spin-off in which the Daleks invade Planet Earth land in, of all places, Sloane Square, Chelsea. Today, the area near Sloane Square has been transformed with the emergence of Pavilion Road, bursting with fashionable food and drink shops. The hidden backwater is an instant hit with local residents and shoppers, breathing new life into the £205m redevelopment of Sloane Street. A charming biopic about J M Barrie, starring Johnny Depp and Kate Winslet, which has scenes filmed in Kensington Gardens, London W2. Agatha Christie’s Poirot: Cards on the Table (2005) was also set in Kensington Gardens. The properties surrounding Kensington Gardens are always in demand for their far-reaching views over the park, proximity to Kensington High Street and good transport links. It is a magical location and little surprise that the area proves popular with homeowners as well as filmmakers. Hitchcock’s The Man Who Knew Too Much in which James Stewart and Doris Day combine to thwart an attempted political assassination in the Royal Albert Hall, Kensington. The concert hall regularly features performances from Star Wars and Disney classics such as Fantasia for families and the Proms. The London Film Festival (https://whatson.bfi.org.uk/lff/Online/default.asp) runs from October 4 – 15.